Royal Bank of Scotland is to pilot a biometric bank card which will allow customers to verify a purchase using their fingerprint. Those taking part in the trial will not need to use a Pin code to verify transactions of more than £30. RBS said the technology was designed to increase security and make payments at tills easier. The trial, involving 200 RBS and NatWest customers in the UK, is due to start in April and last three months. 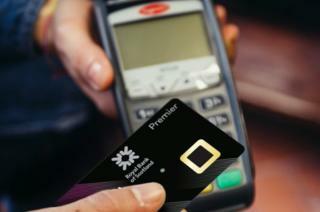 The bank cards are fitted with a built-in sensor, which is powered by payment terminals. When users place their fingerprint on the sensor, a comparison is performed between the scanned fingerprint and biometric data stored in the card. RBS, which described it as "the biggest development in card technology in recent years", is working on the project with digital security company Gemalto, as well as Visa and Mastercard. The technology has been trialled previously in Cyprus and elsewhere, but it is thought this will be its first test in the UK. Howard Berg, UK managing director of Gemalto, said: "Using a fingerprint rather than a Pin code to authorise transactions has many advantages, primarily enhanced security and greater convenience. "Cardholders can pay quickly and easily with just a simple touch, and they no longer need to worry about the limit on contactless payment transactions."